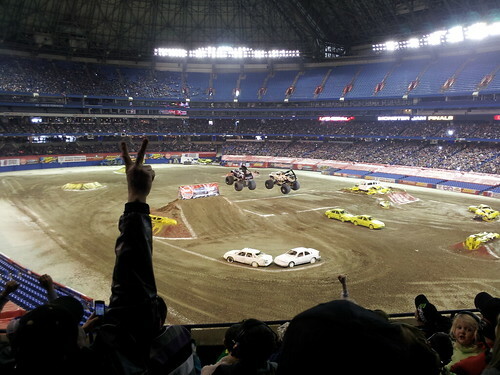 I took the kids to see the Monster Jam this afternoon at the stadium formerly known as SkyDome. Say what you will about the monster truck shows, but it's 3 solid hours of entertainment. There's the monster truck race, the freestyle competition and a demolition derby to top it all off. Oh yeah, and there's motocross freestyle and quad racing sprinkled in the mix. If you've ever been to a monster truck show (this is my third event with my son) then you know that Grave Digger is the Hulk Hogan. He gets all the praise and attention, even though he didn't win anything today. The fastest truck on this day was Mohawk Warrior. Here he is edging out Monster Mutt to win the title. The freestyle event was thrilling, with Avenger winning the crown. The hyped Canadian entry, Northern Nightmare, underwhelmed all afternoon. Here's my review of Monster Jam 2008. If anyone can tell me what happened to Bigfoot, I'd love to know. "Bigfoot ceased running events for the USHRA's Monster Jam series in 1998 (due to a dispute involving Team Bigfoot's usage of video footage and pictures) and has not returned since." Can't we all just get along? Grave Digger is no Bigfoot! A friend of mine named Northern Nightmare. The new humble and fred walk this earth video parody is about to go --- Varmit. I have gone with my sone for about seven years or so now. Friends from Ottawa make the trip to join us; this year we were joined by more friends. Mike, you are right on when you say it is three solid hours of entertainment, enough to keep us coming back. Shut your brain off and the world out for three hours and enjoy. A coworker was there with his kids ... he said it was a blast! I've never been ... I wanna go! My son and my nephew were huge fans of this for over 10 years,and we went religiously. The Skydome (sorry can't buy into the Rogers centre name) though is just a bit small compared to some of the USA shows. The freestyle Motocrossers are probably the 2nd biggest draw, they thrill the kids and I just think they are pretty crazy.